Imagine that you lived in ancient times and wanted to answer some of life’s big questions: How did we get here? What are those lights in the sky at night? Why do I poop? And, for our purposes here: How the heck do plants grow out of the ground!? Well, that kind of grandiose pondering eventually produced some answers. Today, most of us are at least somewhat familiar with photosynthesis, the process by which plants use energy from the sun to survive and grow. But it took us a really long time to get here. The first popular theory on plant life came from one of the most important scholars in history, the ancient Greek philosopher Aristotle. He wrote, in the fourth century BC, that plants derived nourishment by absorbing nutritional soil through their roots. His work was so influential on Western thought that this was the prevailing theory on plant growth for 2,000 years. It wasn’t until the 1500s, when the Scientific Revolution began in Europe that people began to try, at least, to apply rational thought to the great questions of the day. And the life of plants finally got a much closer look. In the early 1600s, Flemish chemist Jan Baptista van Helmont performed an experiment he believed would prove Aristotle’s theory wrong- an almost sacrilegious thing to do at the time. Van Helmont dried a large amount of soil in an oven (to get all the water out of it so he could weigh just the soil itself) and put 200 pounds of it (exactly) into a large pot. Then he planted a sapling willow tree, which he had also carefully weighed, into the pot. He kept the tree in a controlled environment to ensure that it got no nourishment from any outside sources. He watered it with distilled and pure rainwater and kept the soil covered so no foreign substances could fall into it. After five years he removed the tree from the pot, re-dried the soil, and weighed both the soil and tree. Result: The tree had gained 164 pounds- and the soil weighed almost exactly the same as it had five years earlier. If Aristotle’s theory was true, the soil should have been very much depleted. Van Helmont had not only shown that Aristotle was wrong, he had also proven his own theory: that plants grow by sucking water up through their roots and converting that water into plant tissue. Except that van Helmont’s theory was wrong, too. But never mind: Someone had kicked the great Aristotle to the curb, and by doing so had ushered in an entirely new era of botany. Bonus: In 1630, in another experiment, van Helmont burned 62 pounds of charcoal made from wood in a closed container. Afterward, he weighed the ash: It weighed just one pound. Where had the other 61 pounds gone? Van Helmont concluded that some of the charcoal had become a “wild spirit,” or “gas,” a word he coined from the Greek word for “chaos.” And although he called it “wood gas,” van Helmont had in fact discovered carbon dioxide. And that discovery was going to prove to be especially valuable to scientists in the future. News traveled more than slowly in those days; it took 50 years to prove van Helmont’s water-into-plants theory had been misguided and another 50 years after that before the next great leap in plant science took place. In the 1720s, British physiologist Stephen Hales, who had already made a name for himself in the study of animals, started performing experiments with plants. In one of them, Hales attached long glass tubes (1/4 inch in diameter) to the ends of cut-off branches of plants, and measured how far sap could be pushed up the tubes (it was found, for example, that a grapevine could push sap to a height of nearly 25 ft). But Hales noticed something else during his experiments: Bubbles often appeared in the sap- meaning that the cut-off branches were emitting air as well as sap. This, along with other evidence he had accumulated in years of experiments, led Hales to believe that plants absorbed and expelled air- they did, in fact, “breathe” in their own way. It was not the first time the idea was proposed, but it was the first time such an eminent scientist proposed it. Other scientists worked on the theory over the following decades, but with little success. Another 50 years passed. Then, in the 1770s, British scientist Joseph Priestley decided to carry on where Hales had left off- and made one of the most important discoveries ever in the science of botany. It was by this time known that a lit candle with a jar placed over it would soon go out (due to lack of oxygen, although this wasn’t understood then). Priestley expanded on the experiment, and found that a mouse with a jar placed over it would soon lose consciousness and, if left in the jar too long, would die. The theory that explained this phenomenon at the time was that fire, and the breathing mouse somehow “dirtied” the air, making it progressively less pure. Priestley’s experiments proved that plants did something to air. Nobody knew what, but it was an enormous step forward, and just a few years later, in 1778, Dutch physician Jan Ingenhousz repeated Priestley’s experiments, but this time with an added, and ingenious, element: He kept some of the jars and plants in darkness, and exposed others to sunlight. Through those experiments Ingenhousz discovered that a candle would burn longer, and a mouse would be revived by having a plant in the jar… only if the plant was exposed to direct sunlight. What this proved was that plants did something to air- but only with the help of the sun. Science was, once again, turned on its head. Ingenhousz followed up his brilliant experiment by attempting to reconcile his conclusions with a not-so-brilliant theory that had been around since the mid-1600s. What the plants in his experiment were doing, he said, was cleansing the air of an impurity known as phlogiston, which was supposedly produced by fire and breathing creatures, among other things. (The phlogiston theory was posited to explain oxidation processes such as fire and rust.) So once again, a super smart (for his day) scientist was wrong. It took Antoine Lavoisier, the French chemist who had earlier identified oxygen as an element, to disprove the phlogiston theory, proving instead that what plants were in fact doing was emitting oxygen into the air. It had been nearly 2,000 years since Aristotle had made a scientific attempt to understand plants, and nearly 200 years since Jan Baptista van Helmont had debunked Aristotle and ushered in the modern era of botany. At this point, the final steps toward understanding at least the rudimentary science behind photosynthesis were just around the corner. And from here on in, things began to move pretty quickly. The next big question to answer was: If plants were emitting oxygen, where was it coming from? That question was answered in 1782 when Swiss botanist Jean Senebier, while expanding on Ingenhousz’s experiments, proved for the first time that plants absorb carbon dioxide from the air and break it down. That, he said, was where the oxygen came from. (Wrong again, but it was a really long time before this particular theory was disproven.) On the plus side, Senebier was also able to show that it was the green parts of plants, rather than the not-green parts, such as flowers, that did this. This was the part he got right. So: Plants absorb carbon dioxide, use energy from the sun to break it down, convert the carbon in the carbon dioxide into plant tissue, and emit oxygen. 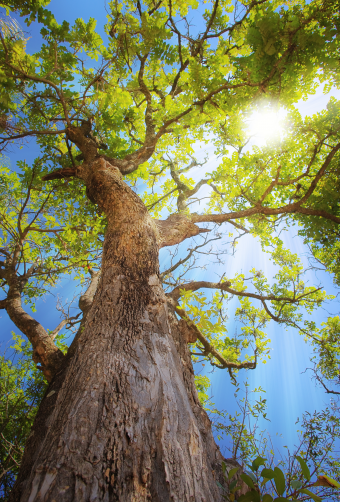 The last really big piece in the photosynthesis puzzle finally arrived in 1804, courtesy of Swiss chemist Nicolas de Saussure, who proved that the carbon a plant got from absorbed carbon dioxide could not possibly be enough to account for the growth of plant fiber. There had to be something else involved- and he proposed that it was water (which botanists already knew was absorbed by plants through their roots). He also proved that plants depended on absorbing nitrogen from the soil. He was right on both counts. The centuries of questions, experiments, failures, and successes had finally paid off, and the basic process by which plants attain nourishment and grow was finally understood. There were many details to flesh out over the ensuing years (especially the discovery of chlorophyll- the stuff inside plant cells that does the actual conversion of sunlight into energy- and which makes plants green), but the basic process had finally been found out. 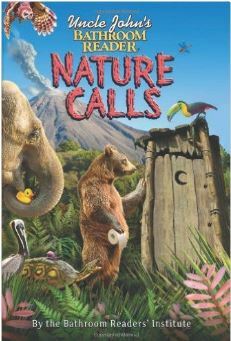 This article is reprinted with permission from Uncle John’s Bathroom Reader Nature Calls. From hornywinks to Dracula orchids, from alluvium to zymogen, Uncle John is embarking on a back-country safari to track down the wackiest, weirdest, silliest, and most amazing stories about the natural world. Just where the Oxygen the plants discard come from ? Broken down nitrates ?